We’d love your help. 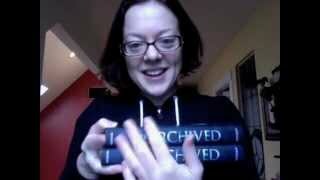 Let us know what’s wrong with this preview of The Archived by Victoria Schwab. Da first brought Mackenzie Bishop here four years ago, when she was twelve years old, frightened but determined to prove herself. Now Da is dead, and Ma Imagine a place where the dead rest on shelves like books. Being a Keeper isn't just dangerous—it's a constant reminder of those Mac has lost, Da's death was hard enough, but now that her little brother is gone too, Mac starts to wonder about the boundary between living and dying, sleeping and waking. In the Archive, the dead must never be disturbed. And yet, someone is deliberately altering Histories, erasing essential chapters. Unless Mac can piece together what remains, the Archive itself may crumble and fall. To ask other readers questions about The Archived, please sign up. I'm confused. Is her Dad actually dead? Cause she keeps referring to him like 'following him through the kitchen' or whatever, but earlier she said he was dead. WHAT. Dhara Parekh You are confusing "Dad" with "Da". She addresses her grandfather as Da, who is dead. Her dad is alive. Is this ya? To what age group would you recommend it? How old is the protagonist? Two years in my brain and more than a year putting it on the page properly. I can't wait to be able to share it. I have to admit, it wasn't until the second half of the book that The Archived really started clicking together for me. I've heard that some people who read the extended preview online were unsure if they wanted to continue, and I can see why--but something about the writing was really appealing to me and I ended up having a great experience with it. * I loved the eerie, something's-n I have to admit, it wasn't until the second half of the book that The Archived really started clicking together for me. I've heard that some people who read the extended preview online were unsure if they wanted to continue, and I can see why--but something about the writing was really appealing to me and I ended up having a great experience with it. * I loved the eerie, something's-not-quite-right atmosphere. All this drama happening in the hushed hallways of a library setting somehow felt pretty creepy. * This isn't written in a fast-paced sci-fi thriller kind of way, and I liked the slower pace and somewhat contemplative tone. * The romantic interests. Yes, there is an "s" at the end of that, but there isn't really a love triangle here, and things are just interesting enough without overtaking the entire plot. * I found the beginning very confusing, in part because I thought "Da" referred to Mackenzie's father, not her grandfather. The timeline also moved back and forth too much for my taste, and the switches in tense itched at me. Also, does her brother's death have some further significance at some point? Between that, her grandfather's death, moving to a new home, etc., there was a lot to take in the opening chapters. * I was also never entirely sure how I understood how the mechanics of everything works in the Library or the Keepers' exact roles. There were also definitely parts where I thought, "No way!" or "I don't get why this just didn't happen." But there came a point when the story started coming together and taking off that I just let go of my doubts and just enjoyed the ride. In fact, I think zoomed through the last half in one sitting, it was such a page-turner! The book is well-plotted, well-written, and touched with some darkness, as well as humor. This isn't a typical sci-fi story, and it's all the better for that. I'm tired of wham-bam adventure stories that do little more than connect the dots between one action scene to the next. This is the first book I've read by this author, but given the many positive reviews I've seen for her debut, I think I need to seek out The Near Witch very soon. And of course, I'll be waiting for the new batch of Archives in the coming year. This book was AMAZING. Everybody needs this book in their life. Do yourself a favor and pick this up ASAP. Oh yes hello, I think I am thoroughly doomed to adore everything written by Schwab. Everything omg. This book was incredible. It's so unique and the writing just hit me and the characters were all tortured and adorable and somewhat sassy -- AND QUITE FOND OF BAKED GOODS -- so basically I am Schwab trash and not even sad about it. What really REALLY hit me (omg Oh yes hello, I think I am thoroughly doomed to adore everything written by Schwab. Everything omg. This book was incredible. 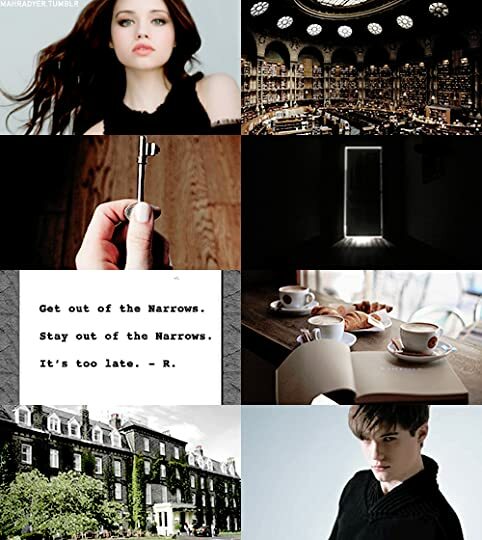 It's so unique and the writing just hit me and the characters were all tortured and adorable and somewhat sassy -- AND QUITE FOND OF BAKED GOODS -- so basically I am Schwab trash and not even sad about it. What really REALLY hit me (omg violent little book) was how unique the story was! It's like a library but for DEAD PEOPLE. And sometimes the dead people escape and wonder around these dark hallways (kind of like purgatory I guess?) and they must have Keepers to haul 'em back to deadness. Meet Keeper = Mackenzie Bishop. She's such a tortured soul and I totally liked her. But you know what I liked even more? THE MAGICNESS AND THE LIBRARY AND THE DEAD PEOPLE. It was all creepy and vaguely dark and I could totally see it as a Tim Burton movie playing out in my head. A+++ basically. And the characters?! Precious little mites. Like I said: TORTURED. When you're a Keeper your life is like (A) lying to everyone because they can't know about your Other Life Chasing Dead People Back To Their Shelves, and (B) you get memories from things you touch, so no touchee to anyone, which makes things lonely, and (C) apparently you have an automatic ginormous need for baked goods. Loving it. So apart from Mackenzie (who narrates in 1st person), she meets Wes who is a smooth-talking and slightly goth dude who got a book thrown at his head, caught it, and carried on a conversation about muffins at the same time. I'm 10000% a gonner and in love. And later on Mackenzie meets Owen in the purgatory-sort-of-place and he is equally mystery and tortured. SO I AM A FAN. Althoooough I maintain the BEST Schwab books are A Darker Shade of Magic series. Thinking back, I don’t remember ever reading something quite like this story before. It was very creative and imaginative, I have to say. The concept refreshing and interesting to read about. Although, there were many things that didn’t work for me as well as they did for multiple other book lovers who read this mysterious looking book. For being mysterious, that it sure was, especially at the beginning. I was eager to learn everything about the main character’s ability and the world-building, needless to say. As the story slowly unfolded itself though, I realized that what was under its white silky fabric (feeling the ghostly atmosphere yet?) was not as impressive as I first predicted…but it had great constituents still. I’ve thought about it…and the protagonist was too young for me. I like my MCs to be at least sixteen years old in my reads. It’s just a personal preference I have, because I like my heroines’ age to be as close to mine as possible so there could be a better possibility of connection. Mac is a Keeper. She keeps Histories. Histories are like…data collections of dead people but, in their own form. That’s how I see them, but they truly aren’t completely explained in the book, if not at the beginning only in brief descriptions. Except an image can easily be made of them after reading this. So each ‘History’ is to be resting in the Achieve, the library – as you can call it – after their death. However, sometimes, a History or two can escape…and Mac’s job is to find them and put them back where they belong. It may seem simple, but it’s not. Especially not when stumbling upon a circumstance of events you do not understand. Someone killed a History, in Mac’s own room, and she needs to find who did it. Even if the pacing starts off pretty slow, the story does pick up and upgrades its speed to a most engaging one as chapters go by. The writing is also pleasant and I believe suiting the story and main character’s voice best. Not the secondary ones. See, most of the secondary characters, except for Mac’s dead brothers, Wesley, Roland and the Histories she is strongly helping, feel one-dimensional. I guess it can be because the heroine didn’t give much importance to many. Even the parents…they’re uninteresting and unfortunately boring and forgettable. The love interest (<-- what a twist!) was really well-developed. I thought the author brought a very pertinent element to the story by including that character. What I liked most was that it wasn’t a romance novel alone and that the romance itself doesn’t steal some importance anywhere. And, by the way, Wesley, Mac’s ‘friend’ reminded me of Jace from The Mortal Instruments, with his personality. He was the most entertaining of them all. What I really didn’t like about the main character though was how easily and often she lied. She did it in every chapter at least two times and it became annoying after some time. Even if she might have felt bad after, it doesn’t change that she didn’t find any other solution than to do that. When a character actually has says: ‘‘It’s the only thing I’ve said that wasn’t a lie,’’ then there is a problem. Her choice of concealing the truth was understandable, depending on the scene, but the so many lies started to frustrate me because, see, the people she lied to didn’t necessarily deserve it. Also, in the story, the narrator didn’t describe the Histories as ghosts, yet, that’s how they appeared to me. The way they talked, moved and just overall; it gave me as impression that they were indeed ghosts…when I don’t think this was the author’s wish. But that wasn’t a negative point, since it didn’t bother me at all. Overall, it was intriguing and enjoyable enough. I hope less lies will be present in the sequel, because I do intend to read it sometime soon. The world-building has a lot of potential, being different from what we’re used to, but the settings could use some variety. The romance was, even if of small importance, lovely, but it could have used more romantic scenes to make it more believable…yet I do understand why the author did not include more. Nonetheless, this was a good book with twists and turns that were remarkable and honestly unpredictable! I really loved the intricate world that Victoria Schwab created, and her writing was great as usual. However. The plot fell so flat for me, and I couldn't bring myself to care about anything that was happening. One redeeming factor aside from the world building was WESLEY. I really loved him as a character and it made me sad that he wasn't a bigger part of the story. I don't think I'll be continuing on with this series (trilogy? duology? who knows. ), but I will definitely be checking out more of Victoria's books in the future (because she is a goddess). I have already read Vicious (and loved it), so I might just enjoy her adult books more, but I'll have to read more to be able to say for sure. Victoria Schwab crafts another beautiful and unique story. "Curiosity is a gateway drug to sympathy." •Do you know when you start a book with preconceptions and you somehow end up liking/not liking the book exactly in the degree you knew you would? Well, I started this book with preconceptions. I liked just as much as I thought I would. That is, a lot. •Since I am fairly sure you grew tired of my eulogies of Schwab's writing a long time ago, I redirect you to my reviews of A Darker Shade of Magic, A Gathering of Shadows and This Savage Song. 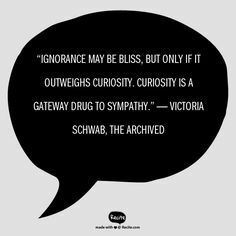 Generally s "Curiosity is a gateway drug to sympathy." •Since I am fairly sure you grew tired of my eulogies of Schwab's writing a long time ago, I redirect you to my reviews of A Darker Shade of Magic, A Gathering of Shadows and This Savage Song. Generally speaking, I found the writing in The Archived slightly less brilliant than what I came to think of as Schwab's usual, but not once was I really unhappy with it. Knowing how picky and hard to please I normally am, my constant and unshakable satisfaction with what comes out of this author's mind is probably the closest thing to a miracle I've ever seen or heard of in my life. •Of course, each one of Schwab's books has something that makes it absolutely unique. The Shades of Magic trilogy has, needless to say, magic; Vicious has superpowers and anthiheroes; The Monsters of Verity series has monsters. 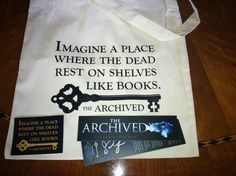 One would say The Archived has a library of the dead, and that that is more than enough to make it unforgettable, and that would be true, but not quite, because actually the thing about The Archived that will leave a permament mark on your heart is its grief. The grief of its characters, of its pages, of its story; the book is so soaked in it that it itself seems to be mourning. It's beautiful and sad, and so simply, gracefully rendered. The sense of loss that permeates every page is, to me, the reason why this story will stand out forever from the infinity of other stories I've read or heard. •I had gotten use to Schwab's characters to be a little reserved, maybe kind of standoffish, and when I read Our Savage Song I was pleasantly surprised to make the acquaintance of two protagonists who seemed to be so vulnerable. Well, Mackenzie Bishop and Wesley Ayers are more open and unguarded yet. 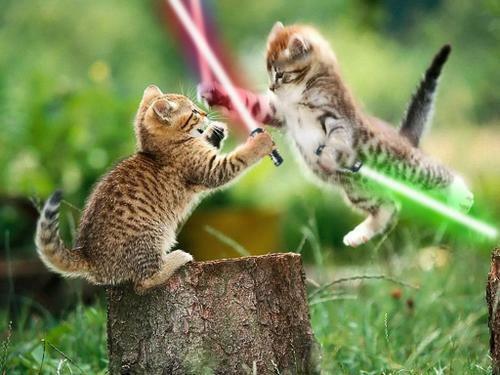 They are strong, they are fighters, but their weaknesses and their loneliness are a blow to the heart. They made me pshysically ache inside. It is impossible not to connect with characters -no, with people- like them. ➽ As I stated elsewere, its' Schwab's, it's good. My favourite remains A Darker Shade of Magic, but The Archived has its peculiar charms. I still have to read the second book and I'm already terrified because it's not sure we'll have the third. Edit: I had so much fun rereading this beautiful book. It was just what I needed. Victoria Schwab is definitely my favourite author. Everything she writes is so solid and fantastic. Can't wait to read book two in this series. Victoria just gets me. She writes the kinds of books I desperately need in my life. Books with such unique plots and world-building. Books with characters that I attach myself to with my entire heart. Books that keep me up way past my bedtime because I just can't stop readin Edit: I had so much fun rereading this beautiful book. It was just what I needed. Victoria Schwab is definitely my favourite author. Everything she writes is so solid and fantastic. Can't wait to read book two in this series. I loved the beginning, the language, the setting and the whole concept. Victoria Schwab can do some real magic with words, which is why I loved this book even more. She is one of the most talented voices in fantasy/YA/science fiction literature and I am baffled and amazed by her writing. The Archived is such a beautiful collection of words. I can't get enough. I have to admit that I really fell for some of the characters. Da, Wesley, Ben and some other minor ones. Everybody and everything just seemed so real. Please. Write faster and give me more magic, Victoria. 1. Wesley Ayers is a ray of sunshine in this drab, gray world. 2. This reads like a more grown up version of City of Ghosts, and I’m here for it. I truly underestimated this book. You know how when you first read a book's blurb and it totally catches your attention as something different and unique? You know that feeling right afterwards that can only be described nothing short of "Gimme Syndrome"? Yeah, that's how I felt with The Archived. But for whatever reason, I got distracted and started picking up other books (you know how it is). Well, one day I was frolicking through my bookshelf, re-read the blurb and engaged the family in a battle of epic proportions for peace and quiet. It was a good thing that I had managed to find this rare thing called reading time, because once I started reading The Archived, I didn't want to stop. Oh boy, Schwab. I am a fan! The premise is so fascinating and fleshed out in the book, that you can't help but to drink the descriptions in. Just imagine a library existing for people who die with the sole purpose of preserving their memories. Then you'd have these Librarians who would catalogue the dead and Keepers to Return the Histories (the dead) to the Archive (library). Like I said, truly fascinating and I think Schawb really pulled it off well. Mac was a fantastic main character. She was smart, resourceful and very relatable. In the beginning, we learn that she has lost both her grandfather, who she refers to as "Da", and her younger brother. The pain and grief that she feels for her brother, in particular, felt very realistic to me. There were scenes where she was desperate to hold onto her brother's memory by clinging to items that once belonged to him. Her feelings of guilt for not being able to protect him, anger at her parents for attempting to move on, frustration at herself for not remembering every detail about him, all resonated with me quite a bit due to my own personal experiences. I thought Mac was brave for dealing with her grief while still upholding her Keeper duties and coming in contact with Histories everyday. Speaking of Histories, I thought that was a really creative way to show a new kind of paranormal character. I would almost classify them as a ghost/zombie hybrid. They look exactly like their human selves except for their eyes. They talk, walk around in corporeal forms and are generally confused about their whereabouts. They also don't know they are dead. (Yikes! Talk about being the bearer of bad news...) Because of that little complication, Mac has to sometimes fight the Histories, forcing them back to the Returns. If you are having trouble with picturing that scenario, just think of Cas hunting ghosts from Anna Dressed in Blood and you'll have a pretty good idea. The plot is where a lot of the magic in The Archived happens. Schwab really wove a great mystery together that had me flipping pages without letup. Since she created a world so different from what I usually seen in YA lit, I was completely surprised at the twists and turns. The ending to this murder mystery is something I never saw coming. Oh and *high fives Schwab for the love interest* I LOVED Wes. Even though he didn't get a ton of page time, I enjoyed the refreshing comical flare he brought to the story. I especially love how his existence didn't take over Mac's life. 'Cause the girl had bigger fish to fry, like, say hunting Histories, making sure they didn't escape into the real world and murder people in their sleep. Kinda important. The only reason why I'm not giving out 5 stars is due to the beginning. It was a little slow and complex with the narrative mode switching back and forth. Sometimes Mac is narrating to the audience and other times she's chronicling her past Keeper lessons with her grandfather, but it's like she's narrating to him (ex. "We used to do this or that together, Da.") I adjusted to this style pretty quickly, but I can see it throwing off other readers a bit. However, hang in there because the flip-flopping tapers off pretty quickly as the story progresses. Not to mention the second half is simply phenomenal. Anyway, brilliant, brilliant, brilliant. I definitely highly recommend people check out The Archived. It's the perfect murder mystery to keep you on the edge of your seat. It's the kind of book that had me thinking about the events long after I finished and now I'll be desperately waiting for book 2. ARC was received from the publisher. Thanks, Disney-Hyperion! The Archived is a book that you learn to love more and more as time goes on. The beautiful descriptions and the spot on characters with flaws who get real time consequences for their actions. I never expected to like this book as much as I really did. I think with Victoria Schwab books I don’t feel pressured to read as fast as I can and instead I savour the way she writes and her descriptions of the places. Same with Vicious, I was in no hurry to finish it but once I reached the end I realised how much I loved it and how much the characters had grown on me. The entire concept of this book was so unique and interesting that I definitely had to pick it up. I mean a place where the dead are kept as records of their human selves. How freaking cool is that. The options as to where this story could have gone was endless. However, the plot decided to focus on a mystery closer to the whereabouts of Mackenzie, our main protagonist. I wouldn’t say that I was a huge fan of her though. Main reason being her stupid decisions (sorry mac), but Da would definitely not have been a fan of what you did. I can understand where she was coming from when she made the decisions that he did but that does not mean that she actually should have ultimately made the choices that she did, after all the experience that she has and the training that she went through. But I guess in the end she is human and she was going through a lot. 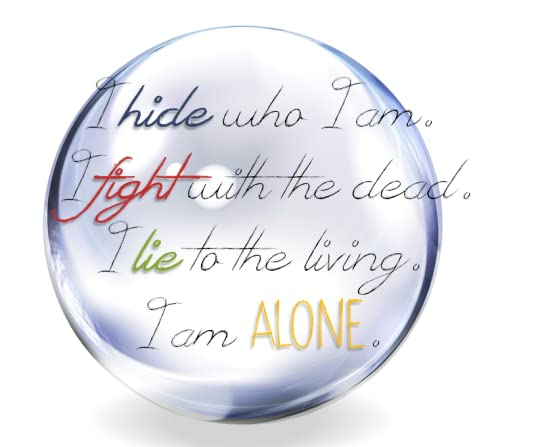 I am seriously becoming a huge fan of Victoria Schwab and the way she writes! There is something so magical and beautiful in her writing style that just draws you in I swear. I’m definitely more excited to pick up more books by her now. The fantasy element in this book is so good and I felt connected even with the minor characters of this book! Seriously the neighbours that Mac had were absolutely hilarious HAHA. The hierarchy of the Archived and the way it works was kept in the dark from Mackenzie and it felt good to learn about these new things for the first time through her eyes. Also this book was made so much better by the presence of Wesley Ayers! Their banter was adorable and I really wish we could have seen even more of him in this book because he was hilarious and supportive and super sweet. Overall, this book was a blast and I’m sure the next one will be great as well but I might read it next year because I feel perfectly content with the way things ended off in this book. This book was very intriguing and Victoria Schwab’s writing just makes this book amazing! Amazing unique fantasy/paranormal story, The characters were great except *you know who, the two pure evil assholes* i Loved Mackenzie but i hated to her attitude toward her mother, i really did. her mom is going through a rough time, everyone is after Ben's death and Mackenzie was just acting strange and sensless! i kind of understood and sympthasied because i lost someone 5 years ago and let me tell you that pain won't go away. The author did an amazing job because i honestly felt the mother and Mackenzie's pain through these pages. The Outer, which you don’t waste much breath on because it’s everything around us, the normal world, the only one most people ever know about. The Narrows, a nightmarish place, all stained corridors and distant whispers, doors and darkness thick like grime. And the Archive, a library of the dead, vast and warm, wood and stone and colored glass, and all throughout, a sense of peace. The story follows a Girl named Mackenzie Bishop who's a "Keeper" her job is to send the unrested dead called Histories from the Narrows to The Archived. Her life turns upside down when her family decides to move to an old building that used to be a hotel things were okay for a while then it gets really creepy and messy, This is all i can say about the plot without spoiling it, The Archives is an amazing read i highly recommend. My love for Victoria Schwab's books – and Wesley Ayers – knows no boundaries. This was so good. Now, excuse me while I go do my happy dance because this was my first 4-star read this year, the short stories not included (which is sad, but glass half full, am I right?). Though published prior to her bestselling Darker Shade of Magic series, I picked up The Archived a lot later. It stands in the shadow of Schwab's more popular releases, and though it is far less hyped, The Archived has no reason t My love for Victoria Schwab's books – and Wesley Ayers – knows no boundaries. This was so good. Now, excuse me while I go do my happy dance because this was my first 4-star read this year, the short stories not included (which is sad, but glass half full, am I right?). Though published prior to her bestselling Darker Shade of Magic series, I picked up The Archived a lot later. It stands in the shadow of Schwab's more popular releases, and though it is far less hyped, The Archived has no reason to hide. 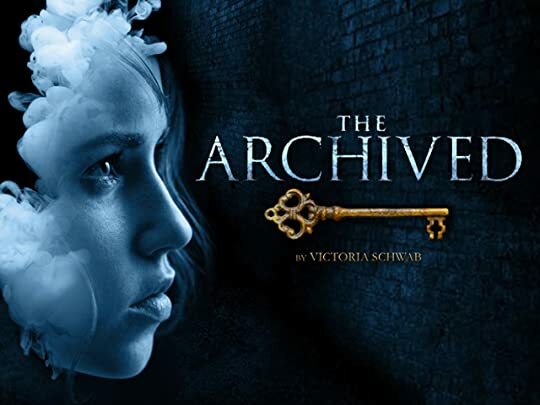 The Archived is – as are all of Schwab's novels – an imaginative, surprisingly moving urban fantasy which builds on the concept of the dead, their histories, and their memories being shelved in an archive. Schwab has quickly become one of my auto-buy authors. And save for This Savage Song, which was a little out of her familiar comfort zone, her works have never failed to impress me. I sensed that Mackenzie Bishop was going to make a relatable heroine from the very first page. There is something to the life Schwab has given this character which I cannot quite name. Mackenzie grew on me instantly with her slightly rebellious nature, her secrecy, and the weight of her responsibilites and loss on her shoulders. Perhaps I read this story at an opportune moment, but I was completely open to Mackenzie's grief over her deceased sibling, only to be left raw by it. I almost had to put the book down because it felt so real. The flashbacks written in 2nd person POV gave her character the depth and background I want in a main character. It became apparent that her relationship with her grandfather was something precious and pure, and even though I am not a fan of 2nd person POV, it really worked its magic in the flashbacks. Alienated from reality by her destiny – to become a Keeper of the Archive and hunt down escaped Histories (the dead) – Mackenzie wraps an intense loneliness around her. Until she meets Wesley Ayers, that is. What a dreamboat. Mysterious Wesley steps into Mackenzie's world and turns it upside down. There is no immediate romantic connection, as insta is not how Schwab likes her coffee brewed, but a steady development instead. The romantic subplot is kept subtle at all times, never overpowering the main plot, which is a specialty of Schwab's books. Wesley had the necessary amount of self-confidence, cockiness, and snark for a male lead. I do think that his character could've been more explored, because it felt as though Schwab had only just begun to scrape at his surface. For example, there were only hints at his familial background, and I wanted to see more. To be honest, it took me a while to get sucked into the story, which is unusual for me. For the first quarter, it was easy to put The Archived aside. The main plot started to captivate me as soon as something went awry at the Archive. When I smell conspiracies, I'm all in. There is a steady increase of tension as Mackenzie looks for answers. Though the pacing is on the slow side, the need to get those answers kept me hooked. As for the romance, I think it was integrated well into the main plot. I must confess that this is the closest I've ever seen Schwab come to a love triangle but even that aspect fits well into the story. There's a reason Schwab has made it onto my auto-buy list, and one of them is her world-building, which has never disappointed me. Compared to other authors which stomp cardboard worlds with no substance out of thin air, it is palpable how much thought and effort Schwab pours into her worlds. Her world-building – a library for the dead, a place surrounded by the Narrows like a city by suburbs, connected to the outside world through mysterious doors – is nothing short of creative and unique. Though not necessarily more complex, it took me longer to grasp the concept of this world than, for example, that of A Darker Shade of Magic. For some reason, I experience more difficulties with urban fantasy because the lines between fantasy and reality blur, and it was no different with The Archived. Perhaps it didn't have that much to do with how Schwab created her world, but more with the genre itself. Schwab's writing is outstanding in its balance between concise wording and elegant prose. She wields her words like a painter would a brush, and it's simply the most delicate, elegant written art to behold. Schwab has continuously managed to write beautifully without falling into the trap of purple prose, which is makes her a mastermind of literature, if you ask me. Don't mind me, I'll just keep gushing while you move on to the conclusion of this review. It’s mystic, it’s creepy, it’s daunting, it’s absolutely brilliant!! The Archived delves into the unknown world. Mackenzie Bishop has been a Keep for four years, stopping unfortunate Histories when the awake and guiding them back into the Archive. But her job is a secret, one that she must hide from the ones she loves with constant lies. When Mackenzie’s family moves away to escape their gloomy past, Mackenzie begins to question all that her grandfather has taught her which leads her to notice a mysterious change overtaking the Achieve. She manages too knit a mystery in-between the chapters that has our minds spinning for the solution! The characters are so strong and unique, harboring their secrets while they try to live what resembles a normal life. They are witty and sweet and pretty darn adorable. And Roland, oh my gosh, that precious librarian!!! Someone keep supplying him with red chucks and trashy magazines, plz and thank you. There’s something so captivating about the book, honestly you need to pick it up right now!! "Stay alive long enough to mess up again. It’s confusing, it’s heartstopping. And it’s so unbelieveably Schwab, if you know what I mean. We are nothing but recorded moments. There’s a reason I’m head over heels in love with her. The closest any author has come to this feeling Maggie Stiefvater, and while I’m more than happy to sell my firstborn for her, she just doesn’t have the magic Victoria Schwab does. What if echoes through my head as I hunt. What if haunts me through the Narrows. What if follows me home. You read any review for th It’s confusing, it’s heartstopping. And it’s so unbelieveably Schwab, if you know what I mean. You read any review for this book, it’s impossible to go further than two sentences without a mention of guyliner. I certainly don’t have anything against Wesley Ayers (look, I'm as much in love with him as the next person) but, he’s no reason to read this book. The crazy to the point of endearing word building is. Victoria Schwab’s awe-inspiring writing style is. It’s been so long since I devoured a book in one sitting, and am I glad this was the book. From chapter one, I was hooked to the core. This isn’t all crazy anti heroes and mindgames, but it isn’t backstabbing and pirates and kisses either. It’s different. But hey, it’s a well known fact I’m Schwab trash. So really, it can’t come as a surprise that I will, in all probability be thrusting this book out to strangers and friend alike, because everybody needs a little weird in their life. I never stop wondering about the who and the why. I just learn to stop admitting it. I just didn't love it. I had been so super excited for this book when I first heard about it and I built up this idea in my head of what it was going to be and it just wasn't anything like that. I think had I have had lower expectations and no previous knowledge of the synopsis, I really would've liked this, but that just wasn't the case. I suppose it doesn't matter how they get out. All that matters is they do. And when they do, they must be found. They must go back. The first few chapters of this really didn't do it for !!!!! The first few chapters of this really didn't do it for me, I must admit. They were slow and, frankly, a little boring, and I really didn't like the narration style very much at first. BUT! Once it grew on me, I ADORED EVERYTHING!! It really kinda gave me Cruel Beauty vibes with a specific ghostly character and also some The Mortal Instruments vibes as well. I could almost taste the shapes of what would become her later books, like A Darker Shade of Magic and This Savage Song. The framework is all there and it's kinda amazing to see the earlier incarnations of what is kinda becoming Schwab's main theme. The world is AWESOME! I love afterlife stories with a passion (like my doomed WIP). The characters and themes are so multidimensional! The mystery was masterful. I still have some holds barred on why those exposition-in-the-past sections were addressed to her grandfather, but maybe the sequel will shed some light. I liked them but didn't see the narrative significance. Truths are messy and lies are messy, and I don’t care what Da said, it’s impossible to cut a person into pielike pieces, neat and tidy. Mac: She's tough and sad and basically pretty great. Sometimes her constant evasion got on my nerves, but it was well characterized so it didn't bother me on a literary level. I really loved her arc. 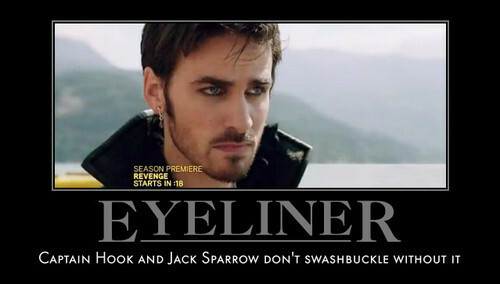 Guyliner: He's the 2013 punk dream boat and honestly, I love him. He's so funny and his banter with Mackenzie really did it for me. The other characters were all equally well developed and realistic. The Librarians were definitely the least developed for all the time we see them in the story, but I expect to go deeper in the next book. I want the things most people don’t notice. The ring and the key and the way you have of wearing everything on the inside. All hail Victoria Schwab and her active imagination! This was another exciting and unique adventure and I can't wait to read more!
" What if I mess up? " " Oh, you will. You’ll mess up, you’ll make mistakes, you’ll break things. 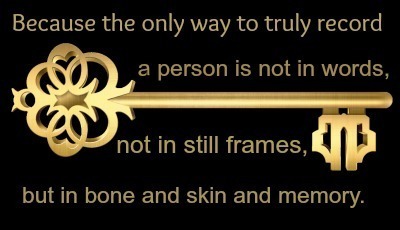 Some you’ll be able to piece together, and others you’ll lose. That’s all a given. But there’s only one thing you have to do for me. " " Stay alive enough to mess up again. " ✶ understand who is Tennahra and Kileken exactly (yes, I'm typing randomly on my keypad) and why the King/the Queen/The Witch/*add random character here* are such weirdoes. But what do I know? In my opinion the beginning isn't dull or boring. It's called... watch out, big big words! world-building people. Characterization. I know, that's pretty rare out there. The story is told from two different times : in present day, we follow Mackenzie, the youngest Keeper in the Archive organization (whose purpose is to keep the dead quiet on shelves), when her family moves in the Coronado Hotel whereas other parts let us have a glimpse of the memories of her training which took place years before - before her grandpa died. Before her baby brother died, jeopardizing all her family, leaving an incurable wound in their heart. I loved the writing, which contains the kind of magical blissfulness I found in The Raven Boys - we're struck by the way the objects seem to be brought to life somehow. 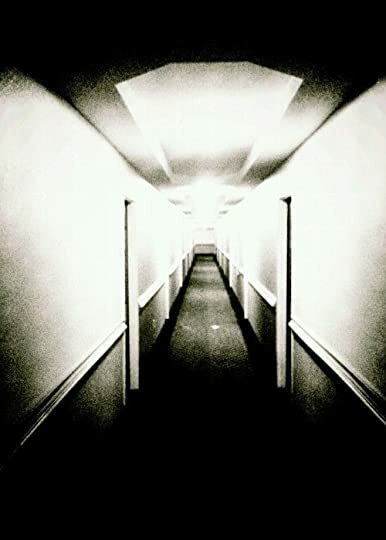 The only thing we have to do is to let ourselves get lost in these corridors, walking through these doors hidden behind our consciousness, and enjoy the enchanted feeling created by Victoria Schwab's pen. I ruined my post-it reserve I had created for... work. Bad me. You take the cigarette out, jabbing the air with the unlit tip. "That is the most worthless question in the world. Use your words. Be specific. Why is like bah or moo or that silly sound pigeons make." Striking fact# 2 : The story fascinated and enthralled me from the beginning to the end : I was hooked. I won't get back to the no, I don't think the beginning is boring conversation, because hey, I'm pretty sure you saw my point earlier. So let's go straight, shall we? 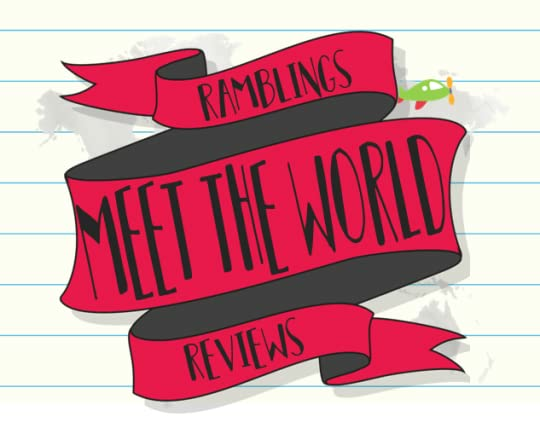 - The world-building is inventive and filled with originality. Of course it is! Seriously, have you ever heard about dead people resting on shelves? Keepers whose job consists of hunting Histories, aka dead who're not so comfortable on their shelves? Well? - Now, the romance. You're worried to find another love at first sight/love overtakes the plot/whatever love does? Try this : friendship, getting to know each other, light and smile-inducing flirting. - Here's a mystery book which actually contains a mystery. I know. I'm excited too. That plot? Thrilling. Intoxicating. Slightly creepy at times. Because murderer people! Trust issues! Bunch of lies! Oh. My. Am I bad to love that so damn much? - Also, Histories' waking up? It gets a strong but awesome zombie vibe, without the lame heroine - yes, you got me! I don't like zombie books! While here I found it fascinating. Striking fact# 3 : Can I have more of these characters, pretty please? As I said earlier, I was amazed by the characterization qualities : you won't believe me, but we get the impression to really know the characters, who are far from the ghosts we're sometimes accustomed to. Now tell me, how incredible is that? "Well, there's this new girl who just moved in on floor three. Her family re-opening the café. I hear she likes to lie, and hit people." "Oh yeah? Well, there's that strange goth guy, the one who's always lurking around Five C."
" Strangely hot in a mysterious way, though, right?" ✔ could be a friend of mine – apart from the fact she can’t really have friends, of course, duh. "M. That's what I call her, this normal, nonexistent me. (...) I can pretend to be M ; I can wear her like a mask. But I can't be her. I'll never be. M wouldn't see blood-covered boys in her bedroom. M wouldn't spend her time scouring her dead brother's toys for a glimpse of his life." ✘ is the savior everybody was waiting for. Hey, what did you expect? He’s a boy dammit! ✔ likes blueberry cupcakes and ... let's see... Did I smile so big it hurt each time he made an apparition? Absolutely. ✔ is genuinely interested in Mackenzie, takes her feelings in consideration, and never tries to take the decision out of her.
" It's the same for me, you know? This is all new to me. And I'm not going anywhere. It takes at least three assassination attempts to scare me off. And even then, if there are baked goods involved, I might come back. " ✔ Is an Archive Librarian whose age isn’t really clear and whose life is a mystery and whose choices are full of selflessness and caring and courage, okay? Why, thank you, can I have the sequel pretty please? The plot and story is kinda easy to follow (except for some parts toward the end) and at the same time it intrigued me a lot. I immediately liked that our girl, Mac had to restart her life after moving to a new place, the Coronado, following the death of her brother, Ben. I have a thing with that concept and I always find very interesting reading and seeing how people live when everything is different. How they interact with new people and how they deal with their new house. And I loved the idea of the Archived itself and especially what Mac’s purpose is in all of this. There are some flashback too that very very cool to read, we learn a fairly good amount of things of her past and how everything started for her. She finally meets too someone with whom she can about talk about all of this, because Wesley is too a part of this world. Her role here is to find escaped Histories around the Narrows and turn them in, she is a Keeper. She has this little note book like thing, where names are scribbled when she has a new job, and they disappear once completed. Said this, there’s a lot going on in this book. Even if everything is pretty simple to understand there are a lot of events and details. I think that this was mainly a mystery but a mystery with a twist. All the Histories' concept is very unique and I liked too how this plot developed. Imagine a place where the dead rest on shelves like books.Each body has a story to tell, a life seen in pictures that only Librarians can read. The dead are called Histories, and the vast realm in which they rest is the Archive. Initial reaction when reading the blurb: Yeah, I sooo want to read this! Blurbs are one of the utmost misleading information to be given to a reader. Reading a blurb and thinking it sounds decent is like watching a movie trailer, and thinking the film itself is awesome, primarily based on all the cool visual effects shown. From the rating - it seems as if I enjoyed the Archived. It was entertaining from time to time. The writing was also decent. But as I kept reading along, I realized the archive (the main storyline of the whole book) is strikingly stupid. This book wanted to be original. This book wanted to be unique. Sounds all clever and new in the science-fiction/fantasy genre, doesn’t it? But several people who will read this book will skip one simple thing. The Actual point behind the Archive. So, in basic term you’ve got copies of these dead people stacked in a place called the Archive which is organized by the librarians, who are the only ones able to access it. But what’s the point, if the only people able to enter the Archives are the librarians? Why bother making copies of millions of dead people, if in the end there’s nothing beneficial or effective about this entire system? You can almost imagine my absolute confusion when someone attempted to bring this utterly useless system down. Even with an explanation, I was still unable to comprehend the reason behind bringing down the Archive. It’s almost as if the author had this amazing idea and was completely excited by it, that she rapidly started writing the book before she even began to structure it thoroughly. I’m not sure if I even want to get into the mystery part of this book. Mystery can be thought-provoking with very skilful writers. Most of the writers that are capable of constructing a beautiful mystery have an understanding in criminology. I’m not convinced this author did. 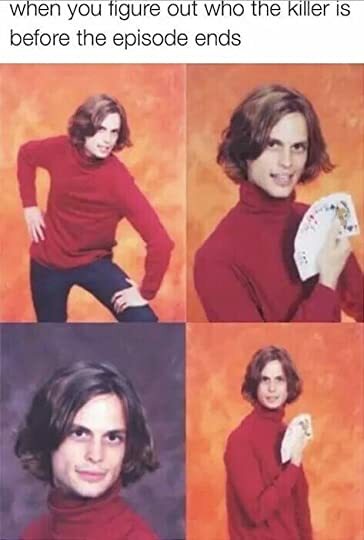 In most of the books the person who turns out to be the psychotic antagonist is the person you least suspect, who you actually end up suspecting nonetheless. Yet, the authors are still are unaware of this. The heroine Mackenzie Bishop is a keeper. She guards the place known as the narrows. 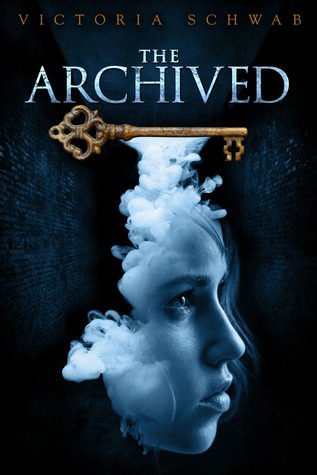 It’s a place where histories (dead copy of people) go when they escape the Archive, and her duty is to catch them swiftly and put them back into the Archive before they escape into the real world. Woah! The Heroine’s role sounds interesting. Though, it wasn’t. All Mackenzie did was catch dead people and put them into the Archive. That’s all she did. At first it was cool then it wasn’t. With Wesley, there is too much to lose. But with Owen, there is no future to be lost by giving in. No future at all. Only escape. Yes, it’s time for the romance part of the book. As we have observed from the quote above there's a love triangle. Two love interests. Wore eyeliner and never stopped complimenting himself on how handsomely attractive he was. Well, umm he was dead. I wasn’t a fan of the romance. It was just a big capitalized NO for me. Actually, I disliked the romance because it was awfully monotonous. I noticed something else as I went through this book and I will make it as explanatory as possible. All of us probably watch sitcom shows, right? Shows such as big bang theory or how I met your mother. A big major detail we pick up on is the setting. The settings in sitcom shows are always the same, virtually in every episode. For example every episodes of how I met your mother will be held in apartment or a bar – not always but regularly. The setting in the book for the archived is in Coronado which is located in San Diego, but I’m pretty sure the author never stated that, however that’s not the problem. The problem is the author doesn’t use the Coronado setting to her advantage. Throughout the entire novel the only place I’ve gotten a description of is the narrows or the apartment. I felt so trapped. The narrator never goes anywhere besides those two main places. I truly don’t see how someone cannot view this as irritating. It all seems strange because I still granted the book almost three stars. I only did this because of the potential – there was so much potential. I have too many things to say about this book, but I won’t be able to voice them all because they’re all entwined to make these conflicting emotions, which I can’t put into words since they won’t make any sense to others. Maybe you should give the book a shot/maybe you shouldn’t. "Knowledge is power, but ignorance can be a blessing." I'll be honest this started off a bit slow for me and I got a bit of trouble getting into it....but once I reached about half way through it picked up and I began to love this. Amazing concept and storyline with wonderful characters. I can't wait to move unto book two. Another great creation by Victoria Schwab. This is my Book Of the Month- January 2017, with GR group- Nothing But Reading Challenges- Category: Young Adult BOM. The concept of this book is splendid-- The dead are called Histories, and the vast realm in which they rest is the Archive. Imagine, every live ever lived, all the memories in a library, secured! "The Outer, which you don't waste much breath on because it's everything around us, the normal world, the only one most people ever know about. The Narrows, a nightmarish place, all stained corridors and distant whispers, doors and darkness thick like grime. And the Archive, a library of the dead, vast and warm, wood and stone and colored glass, and all throughout, a sense of peace." "A confession: sometimes I dream of being normal. I dream about this girl who looks like me and talks like me, but isn't me." My problem with this concept was that Mac started as a keeper at the age of 12!! That's right, no kidding! This was a little too much even for a fantasy novel. "My brother left a hole, and it's starting to close. And when it does, he'll be gone. Really and truly gone. Isn't this what I wanted? For my parents to stop running? For my family to heal? But what if I'm not ready to let Ben go?" I really like this whole bit in the book as it made Mac seem more real to me. There are some interesting characters and few good twists and turns that keep you turning the pages. What an interesting good read! This world that Victoria has created blew me away! WHERE DOES SHE COME UP WITH THESE IDEAS! She's such a great writer. It was so confusing at first but after a while I got it. But I think the only reason why it was confusing was because the world was so different from most books I've read. Basically, there's Keepers, Crews, & Librarians! They all work with the Archived which is where the dead go to rest—they become Histories. The Archived, in my head is like a H What an interesting good read! Basically, there's Keepers, Crews, & Librarians! They all work with the Archived which is where the dead go to rest—they become Histories. The Archived, in my head is like a HUUUUUGE library of dead people (Ha, Doctor Who, anyone?) then there's the Narrows & the Outer. The Outer is where we live, the living people. And the Narrows is where the Histories sometimes escape to! I pictured that as a scary dark hall full of corridors and doors! So Keepers guard the Narrows. The Crew guard the Outer, and the Librarians guard the Archived, in the library place. I'm really excited to read the second one. To find out more about Mac, Wesley (omg hot baby! ), Roland (I like you very much, sir!) and the rest of the world! “What if I mess up?" "Oh, you will. You'll mess up, you'll make mistakes, you'll break things. Some you'll be able to piece together, and others you'll lose. That's all a given. But there's only one thing you have to do for me." “Lying is easy. But it's lonely." "When you lie to everyone about everything, what's left? What's true?"